Qiongtai Fudi (Felicitous place) is at Guandi Lane, 28 Wenzhuang Rd, Haikou, Hainan Province, China. The following text is from a sign at Qiongtai Fudi. I have not attempted to correct spelling or grammar. The Synopsis of Qiongtai Felicitous Place. Since the early days of Song Dynasty Qiongtai has been still the term of endearment of Hainan. According to legend the terrain of Hainan Island is a head-shrunk deified tortoise, Grand Emperor of Song Dynasty (Song-taizu) was afraid of that it could stretch out its head to threaten the dominion of Song Dynasty, and then the State Town has been moved to the place where the head of the deified tortoise was shrunk. Xining sixth year of Songshenzong (1073), Qiongguan Pacification Department was set up in Qiongtai which governs the administrative affairs of Hainan Island in order to keep the head of the deified tortoise under control, therefore the place has been called as Qiongrai by old contemporaries. Yongle first year of Ming Dynasty (1403), Yangyi, Commander of Hainan Garrison Command, erected a stone tablet on Baoer Hill on the peak, and set a stone memorial archway Qiongtai Felicitous Place near the south of the hill. Hongzhi first year of Ming Dynasty (1488), Baoer Hill was dug, the Military Temple was constructed for worshiping Guanyu. Qianlong 22nd year of Qing Dynasty (1757), Zhang Jianqi, Imperial Inspector, restored Qiongtai Felicitous Place to comply with the aspirations of the people. Qianlong 43rd year (1778), Wang Hou, County Magistrate of Qiongshan, made seal cutting two characters Qiongtai and carved on a stone to erect a monument. Qiongtai Place was named as Baoer Hill, which is one of the peaks in Fucheng Town. The mystical school scholar said that the virility which is gone down south day by day from north-west continent of China, crossed the sea, moved under water, was collected and distributed below Qiongtai in the first place that was called as Felicitous Place. Guandi Temple was built in Qiongtai which is the largest Military Temple in Hainan, and there are also Wenchang Pavillion, Female Deity Ancestral Hall, Worshiping pavilion, Drama Stage, Stone Memorial Archway etc. Constructed here is the Famous old cultural resort. 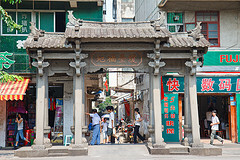 In 1999 approved by Culture, Broadcasting and Television, Publishing and Sports Department of Hainan Province, Qiongshan Municipal people’s Government made rebuilding, pouring the piles into the ground, the sides of platform were reinforced, the memorial archway of Qiongtai Felicitous Place was rebuilt, the Monument of it (the Formal Door of Felicitous Place and Qiongtai Pavilion), East Small House and West Small house have been constructed, the banister of Old Well Felicitous Spring have been built. Guandi Palace of Qiongtai Felicitous Place for holding a memorial ceremony of culture has been repaired the reconstructed area 1300 sq M, the architectural style has been preserved in reconstructed project, fitting up in style of ancients, well laid out location, symmetric structure, carved beams and painted rafters looking splendid in green and gold, porcelain carving and carved dragon, extremely lifelike and magnificent. Qiongtai Felicitous Place is the major protective unit of culture relics in Qiomgshan City, which is also a spot enjoyed and studied the synthetical distinguishing features of Qiongshan City. Welcome to this place of treasure, reserving your footprints, yout memory and your good name.